Keeping with the theme of Heaven's "Hall of Fame," while Bl Teresa of Calcutta might be the more celebrated daughter of Indian Catholicism, it emerged at the weekend that another 20th century woman religious will become the billion-plus country's first modern canonized saint and, two millennia after Christianity arrived on the Subcontinent, only its second overall. At Saturday's "ordinary" public consistory, B16 formally green-lighted the final progress of Bl Alphonsa Muttathupadathu, a Poor Clare Franciscan nun from the south coast state of Kerala, to the honors of the altars. The saint-to-be, who died at 35 in 1946, was beatified in 1986 by John Paul II. Her canonization will take place in Rome on 12 October, during the international Synod of Bishops. Alphonsa was not known for her social outreach like Mother Theresa but for her silent sufferings and prayers. Her life was largely confined to the four walls of her convent and to her bed due to illness. After losing her mother when she was only three months old, she was raised by an aunt who sought to marry her off to a man from a rich family. But Alphonsa insisted on following the example of Theresa of Lisieux and joined the Franciscan Clarist convent in 1928 taking the name Alphonsa. Despite poor health, she persevered in her commitment to religious life and made perpetual vows on August 12, 1936. She died 10 years later after years of illness and great suffering. She suffered serious injuries in 1923 when she fell into a pit of burning chaff. The accident left her permanently disabled. In December 1936 she was reportedly cured through the intervention of Blessed Kuriakose Elias Chavara, but three years later she was struck by a severe attack of double-pneumonia. Once a thief stumbled into her room in the middle of the night and frightened her leading to memory loss. She received extreme unction on September 29, 1941. The next day she regained her memory, though not complete health. Her health improved over the next few years. But in July 1945 she developed a stomach problem. 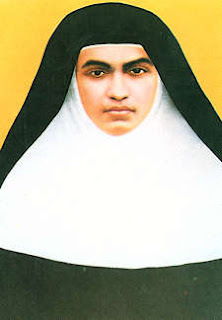 She died on July 28, 1946, aged 35 and was buried at Bharananganam in the Diocese of Palai and her tomb became a pilgrimage site where miracles are said to happen. She became known as Venerable Sister Alphonsa. Shaji Joseph and his wife Lissy rushed to the tomb of Sister Alphonsa in Kottayam the moment they heard the news of her canonization on October 12. Their son Ginil, who was born congenitally deformed, had been cured after Joseph put the boy on the tomb of Sister Alphonsa in Bharananganam and the family prayed for hours. That same night in 1999, Ginil began to walk — a miracle which was approved by the Vatican. Joseph and Lissy now face a new problem. Many believers have begun quizzing them about their prayers. “Since the canonisation is scheduled in October, people from various parts of the state, many of them physically challenged, started making a beeline to the church. Some of them insist that we should reveal the details of our prayer,” said Joseph, an employee with the sales tax department. He wants to go to the Vatican to witness the canonization ceremony. “If I get a chance I’ll take the entire family to the Vatican. Ginil is really interested,” Joseph said. Even the doctors who treated Ginil believe a miracle did happen. For the record, those whose healings were investigated traditionally take center stage at canonization celebrations. Until now, the sole canonized Indian was another Franciscan; Gonsalo Garcia (1556-1597) was a half-Indian, half-Portuguese missionary numbered among the "Nagasaki martyrs" crucified together on 5 February 1597. Led by the Jesuit Paul Miki, the group of 26 missionaries and converts -- whose collective feast is celebrated on that date -- was canonized by Bl Pius IX in 1862. In other news from India, the recent bishops' plenary's focus on the role of women has been greeted as a "pioneering" move.